IMPORTANT NOTE: This is a discontinued product. Discontinued items cannot be returned or refunded. The item is warrantied for 30 days to be free from functional defect. 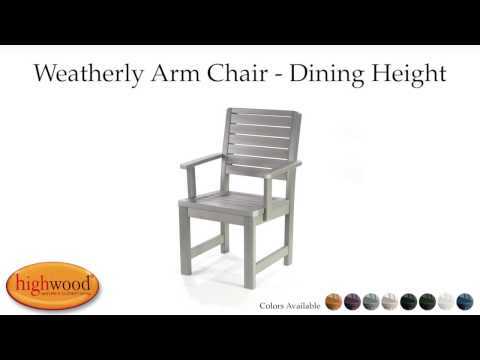 The Weatherly Dining Armchair takes its design cues from the extremely popular Weatherly Collection. Casual and comfortable lines create an impressive look that complements any of our impressive table options. The horizontal seatback slats are both refined and inviting. The chair has been load-tested, ASTM 1561-03 (2008) standard for Outdoor plastic furniture and has a 500-pound weight capacity. Assembly is required (see assembly guide).